Between 1st and 9th October Butlers Bingo will be putting on a seasonal bingo promotion called Autumn Antics. There will be £5730 in bingo bonus to be won in this promotion so it’s well worth a go especially as we all seem to be spending more and more time indoors escaping the cooler weather that has been creeping in. Keep an eye out for the Autumn Antics Game which will play daily between 1st and 9th October. If you get a Full House in this game you will win an extra £4BBz and your Nabors will each get an extra £1BBz! 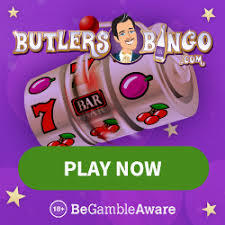 Butlers Bingo is fairly new to the online bingo world so you might not have played there yet but you really should give them a go. The Butler offers a free £10 no deposit bonus for you to try the site for free and then there’s 150% first deposit bonus up to £150 waiting for you. Butlers Bingo also awards players 25% on all future deposits too so you get a little extra every single time you find your account which is always a bonus, literally!